Description: "In Jewish tradition, pomegranates symbolize righteousness, with seeds said to number 613, the total commandments in Torah. In Deut. 8:8, pomegranates, barley and wheat prove the bounty of the Land of Milk and Honey. The calyx atop the fruit inspired the original Jewish crown. One Persian hero of myth consumed a pomegranate and became invincible. Muhammad instructed: “Eat the pomegranate, for it purges the system of envy and hatred.” Newlywed Greeks eager for a family crush one under-heel for fertility. Buddha cured a child-devouring demoness of her evil habit by instructing her to eat a pomegranate. Whether for knowledge or temptation, for virtue or valor, for art or for love, revel in the sumptuous pleasures of ORIGIN. To Life...L’Chaim!" — Shmaltz Brewing Co.
Random thoughts: I recently tasted He'Brew's Hop Manna and didn't care for its overwhelming hop bitterness. I hope Origin is better. 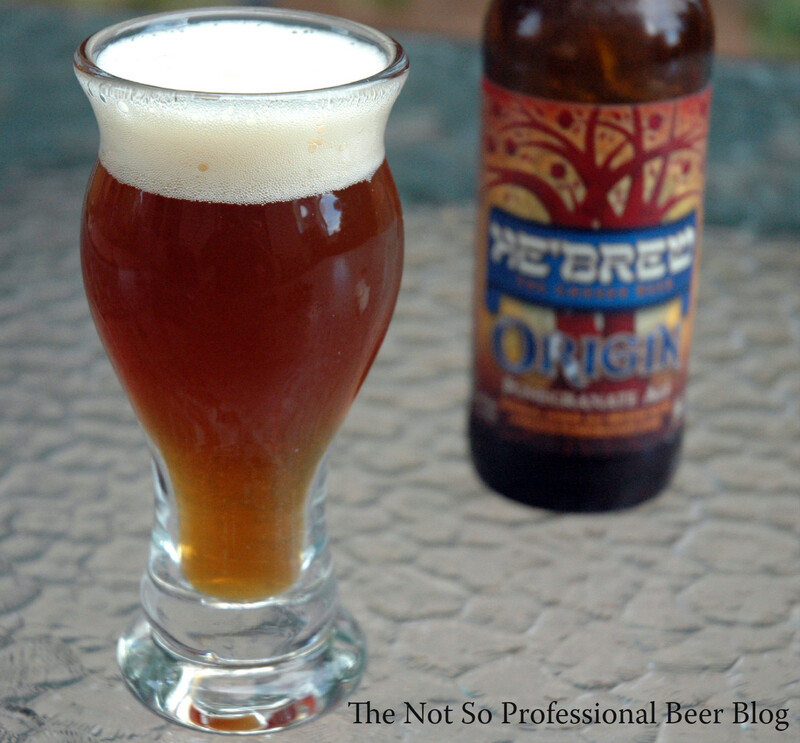 This is part of my series on beers with fruit and the first Imperial Amber Ale I've profiled. The tasting: Dark amber in color, hazy, with an off-white head that dissipated very slowly. Excellent retention. Aroma is very malty—full of caramel. It reminds me of the malt extract that I brew with. I also noticed some light citrus hops. Flavors of caramel malt, bready malt, and tart pomegranate. The fruit adds a touch of sweetness, but provides a nice tartness in the middle and finish. This beer has six varieties of hops, but they're all pretty much lost between the malt and the fruit. It's medium bodied and has a sticky mouth feel—there's definitely some weight to this beer. The 8.0% ABV is not noticeable in aroma or flavor. It finishes with tart pomegranate and a slight hop bitterness. Overall, Origin Pomegranate Ale has a unique mix of sweet, bitter, and tart. Rating: 4 star. Really Good! I want this again! Although the flavors in this beer were simple, I thought the combination was great! I enjoyed the balance of malt sweetness and pomegranate tartness. It's a memorable beer and one I plan to revisit. 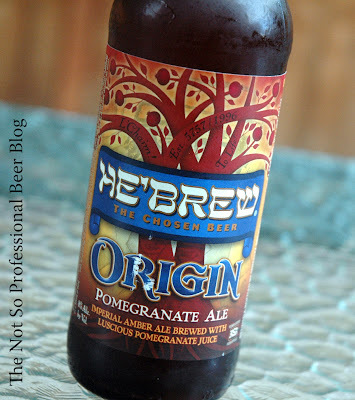 Have you tried Origin Pomegranate Ale or any other He'Brew beers? It's been a while but, according to my notes, I did not like this beer. According to my extended notes, I rated it the equivalent of a 2 (out of 5) on your scale and wrote: "Hides the 8% well, but isn't necessarily pleasant." I like strong opinions. Do you recall what aspect of the flavor was a turn off for you? The strong malt, the tartness, or something else? BTW, did you try their Hop Manna? What dud you think of that? I distinctly remember disliking it but, alas, I did not keep good notes on that one.